The 2016 World Press Freedom Index shows that world leaders are cracking down on the press' freedom. World leaders paranoid about journalism are cracking down on press freedom, continuing a recent trend in which governments are increasing their influence over the media. "There has been a deep and disturbing decline in respect for media freedom throughout the world," free press advocacy group Reporters Without Borders said in a report released Tuesday. 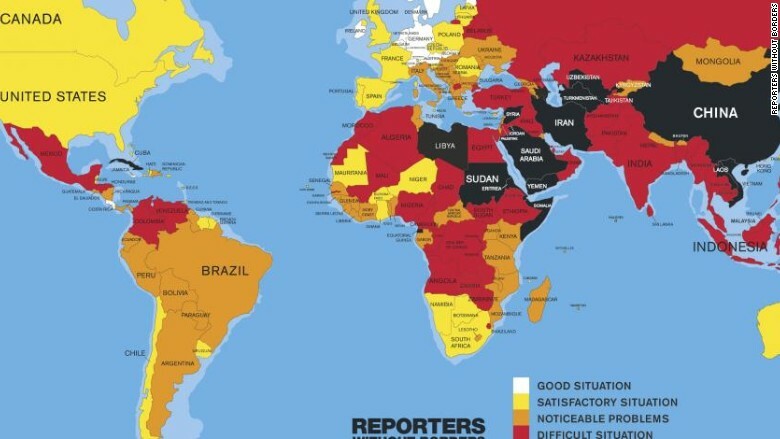 The group's World Press Freedom Index ranked Turkmenistan, North Korea and Eritrea as the least free countries for journalists. Three northern European nations -- Finland, Netherlands and Norway -- topped the ranking of 180 countries. Tajikistan dropped 34 spots from last year's list to rank 150th due to the government's more authoritarian outlook. Brunei also plunged 34 slots after its interpretation of Sharia law resulted in threats of blasphemy charges and self-censorship. Poland, meanwhile, fell 29 slots to 47th after the country's conservative government gained more control over the public media. The United States ranked 41st on the list, eight spots lower than in 2015. Europe was the best overall region for journalists. Africa overtook the Americas after that region suffered increased violence against the media. North Africa and the Middle East ranked last. "It is unfortunately clear that many of the world's leaders are developing a form of paranoia about legitimate journalism," Reporters Without Borders secretary-general Christophe Deloire said in a statement. "The climate of fear results in a growing aversion to debate and pluralism and a clampdown on the media by ever more authoritarian and oppressive governments."